Winston the duck is born on Cady Cove Lake to Mr. and Mrs. Mallard Duck. All the animals come to see the blessed event. But when Winston is born, he has a big orange bill that makes him different. Winston knows God made him different for a reason and is determined to find out why. One night after the family goes to sleep, Winston heads out on a journey around Cady Cove Lake. He meets Mr. Turtle who laughs at him, but Winston just keeps walking. 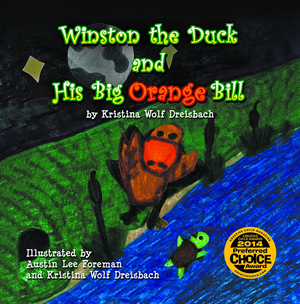 He meets Mr. Raccoon and together they search for the reason Winston has a big orange bill. The two get into trouble with an owl that wants to eat them for dinner! When Mr. Raccoon is swooped up, Winston latches onto the raccoon’s tail and prays to God for the strength to save his friend. God gives him the strength and he is able to pull Mr. Raccoon out of the owl’s clutches. They land in the lake and Mr. Raccoon then realizes the reason Winston has a big orange bill. Wait until you hear why! Kristina Wolf Dreisbach is a preschool teacher in Jeffersontown, Kentucky. “Children in my classes loved to hear my stories that I wrote or made up on a whim for them. My dream has been to write a children’s book and now God has made my dream come true! I hope every child who reads this book will know that God makes us all different, and to be confident in Him and who He has made us to be!” Her family once had a duck named Winston.